The LUM-171G is the practical combination of FHD panel and 4K interface that is best for 4K/UHD monitoring and field production. 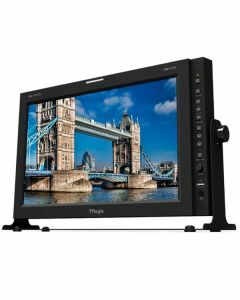 The 17" LUM-171G is a Ultra-HD or 4K field monitor with a 17" native 1920x1080 LCD panel, with LED backlight, that can display full screen Ultra HD video or 4 individual 1920x1080 images. The LUM-171G is designed for high-end 4K cinema & video production as well as high-resolution industrial, military, medical and CAD design applications. The LUM-171G can also display 4 inputs at a time or scale 1 input to of full screen. It offers the industry's most advanced features and video processing. Functions: Blue Only, H/V Delay, Marker, Mono, SingleMode, Camera Lut.